For every one shall be salted (seasoned) with fire, and every sacrifice shall be salted with salt. Salt is good: but if the salt have lost his saltiness, wherewith will ye reason it? Have salt in yourselves, and have peace one with another – Mark 9:49-50. Salt is a preservative; it protects from harm, damage keeps food from spoiling, it gives flavor. “Season with salt” refers to the trials and judgments that all will face, believers with trials that purify faith, unbelievers with the eternal fire of god’s judgment. Salt is a crystalline mineral that is composed primarily of sodium chloride. It is essential for animal life in small quantities. Salt is involved in regulating water content (fluid balance) of the body. 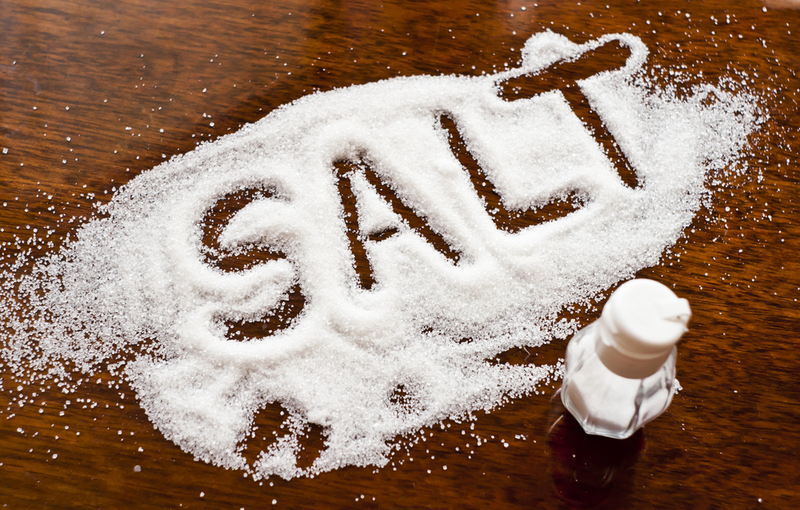 Sodium is used for electrical signaling in the nervous system. Before refrigeration farmers would use salt to preserve meat to keep it from spoiling. Salt is also used for seasoning foods to bring the flavor. Jesus was talking with His disciples informing them the consequences of sin using at the latter end of His instructions what to expect as a believer and what they should be doing as a believer; using salt as a substance that would preserve. Many times Christians don’t go any further in their salvation other than the water baptism indicating they believe God and Jesus is the Son of God. Salvation is free, but to grow spiritually, we have to deny ourselves and submit to the will of God in our lives. In today’s Christian messages most of them are on the promises of God and what to expect from God, but rarely will you hear about how to give to God. God desires something in return that is why Jesus is instructing the disciples to have salt in themselves because there will come a time in every Christian’s life when trouble comes, and it will bring out the true you. Attending church without submission to the Word of God is an illusion of one receiving eternal life to live with God. This is why Jesus instructed His disciples in order to follow Him they would have to deny themselves (No man can serve two masters: for either he will hate the one and love the other; or else he will hold to the one and despise the other. Ye cannot serve God and mammon – Matthew 6:24). Mammon refers to wealth, money, or property. No one can serve two masters because a time will come when they make opposing demands. Jesus advised us to invest in our future with Him by giving of ourselves, mammon encourages us to collect material objects for our present enjoyment, but there will come a day that we will die and what we’ve invested in this world will not be taken with us. So while on earth we must invest in ourselves spirituality that will give us entrance to heaven. God allows trouble to come in our lives to bring us closer to Him or uses the very thing we have placed before Him to come against us. Christianity comes with trials and tribulations. Either you’re in a trial, going into one or coming out of one. Just because we’re Christians doesn’t exempt us from trouble. We will suffer in this walk with the Lord that is why we must be rooted and grounded in the Word of God, we must allow the Word of God to preserve us, and we must allow the Word of God to cleanse us from the filthiness of the flesh and spirit. We must have enough of God in us to draw others to God; that’s the flavoring of Christianity. Salt brings flavor to food, and we should be flavor with Christianity, a life that will draw others to God through our lifestyle of the Fruit of the Spirit being manifested through us to others, the Fruit of love, joy, peace, longsuffering, gentleness, goodness, faith, meekness and temperance. A humble and meeks spirit in our hearts and in our minds, living a life that will be pleasing to God. God wants every part of our being, not just on Sunday’s. He wants us to live our lives as though He was coming today because tomorrow is not promised to us! It’s too many tomorrow Christians, ‘ “I will do better tomorrow,” what if tomorrow never come? Whatever life we’re living, this is what we will be judged by whether it’s good or bad. This is why the Apostle Paul admonished the Christians to live a life every day as though Jesus was coming ( I beseech you, therefore, brethren, by the mercies of God that ye present your bodies a living sacrifice, holy, acceptable unto God, which is your reasonable service – Romans 12:1) As believers we should be dedicated to an act of surrender or submission to God’s will for our lives whereby we become a “living sacrifice”. God wants our soul [mind, will, and emotions] accompanied with our body as a vessel of honor. Jesus informed His disciples then and now “everyone shall be salted with fire” If you are a believer you will go through trials and tribulations that will make you bow in prayer. The time we spend in prayer washes us, creating us to be more in the image of the Father and the Son. Salt of tribulation will sting the wounds of sin; it will preserve our spirit and soul to be subject to the Word of God no matter what we go through. Sanctification brings about a spiritual change in our thinking which brings about a change in our behavior and character. True Christianity is a life of mountain and valley experiences, this is what causes us to mature spiritually (2nd Peter 1:5-7 And (but for this very reason) beside this, giving all diligence, add to your faith virtue; and to virtue knowledge; and to knowledge temperance; and to temperance patience; and to patience godliness; and to godliness brotherly kindness; and to brotherly kindness charity). Today’s teacher’s instruct believers they don’t have to suffer as Christian which contradicts the Word of God. The Bible teaches, Jesus suffered and through His suffering, He learned obedience ( Though he were a Son, yet learned he obedience by the things which he suffered – Hebrews 5:8). Jesus experienced all of what a person goes through on this earth. He knows how difficult it is to obey God completely, just as He understands the attractions of temptation, yet He persisted in obedience, leading a sinless life, and He has given us the power to resist sin (According as his divine power hath given unto us all things that pertain unto life and godliness, through the knowledge of him that hath called us to glory and virtue – 2nd Peter 1:3). Jesus chose to live His life according to the will of the Father, it was a continuous process of making the will of God the Father; His own will. He chose to obey although His obedience led Him to suffer and death. Our submission to the will of God will also bring suffering and death to the things of the world. When we chose to live according to the will of the Father, we too will suffer and because we have a sin nature, as we surrender ourselves to God, the sin nature will die. As we die to ourselves this will allow the Spirit of God to operate in us and through us. We will love the way He instructed us to love, we will forgive as He informed us to do. We will live our life as a living sacrifice, and every sacrifice is seasoned with salt! Hurt and pain make you pray, prayer cleanses us from the spirits of anger, unforgiveness, resentment, envy, and jealousy, as well as hurt. Hurt is a spirit, and if hurt causes us to pray, then God will allow hurt to come to bring us to the prayer closet. The Spirit of God is not manifested in the church as He was in the days of old because the people didn’t care what they had to go through in order to bring the Glory of God in the Church. People were being healed, deliverance in their minds and spirits were being manifested. Miracles were being manifested in the lives of the people because the people was thirsty after God and not things. Too many churches are filled with people who are hurting and cannot show love because of the things they have been through in life. The only way the gifts of the Spirit will operate effectively is through the Spirit of Love. God is love, and if He’s abiding in us as we say He is, no matter what we have been through or going through, the Spirit of Love will manifest, a matter of fact the Spirit of Love manifest itself even the more through hurt and pain. If the Fruit of the Spirit is there, it will manifest itself. The gifts God give us is without repentance, meaning God has given each of us gifts, and those gifts will manifest whether or not we have submitted to God or not because He will not take away gifts He has given each of us. Practicing sinners have gifts (For the gifts and calling of God are without repentance – Romans 11:29). Just as God will never forsake His promise to the Jews, He has also given us the same promise, since we’re the spiritual Jews (But he is a Jews which is one inwardly; and circumcision is that of the heart, in the spirit, and not in the letter; whose praise is not of men, but of God – Romans 2:29). Salvation with sanctification is to anyone that will accept the invitation. If we allow God to take us to the valley, He will clothe us with His righteousness, He will wrap us with His love and it will overflow to others, that’s when we allow God to season us with Salt! Salt heals and purifies and this what God want in every professing Christian. Salt draws out the impurities in our behavior and character. When God looks upon us, He wants to see the reflection of His Son. When the reflection is tainted with sin, God allows trouble to come into our lives to make us fast and pray; whatever it takes to draw us to Him and away from the world, He will allow it to come.